The most advanced integration of crisis management, attendance, discipline, and anonymous reporting for our schools - all from a single interface. School communities need a software solution that adapts to the systems they already have in place and the ongoing safety needs of their school. One that not only helps them manage their students, but accounts for them and keeps them safe. That's why schools rely on Trinity. Trinity is a customizable school management platform that has the ability to integrate with other school management systems. Trinity uses active and passive technology to manage school attendance, manage discipline, and prepares school staff and students to identify, confront, and resolve crisis situations. With Trinity, schools will be prepared. 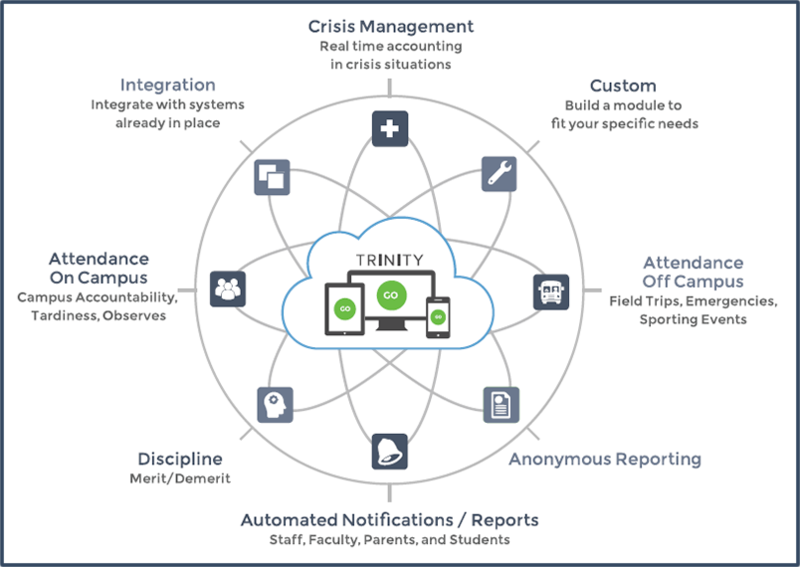 In every crisis situation that my occur, Trinity will help administrators and faculty quickly identify and respond to a crisis, rapidly account for all students and staff, ensure open communication throughout the crisis, direct emergency responders, manage parent notifications, coordinate student-parent reunification, and reduce overall negative impact. Enables all users to initiate a crisis and indicate the severity. Enables users to recommend a response based on the crisis severity. Immediate notification to teachers, administrators, students and parents upon initiation of crisis. Contacts 911 in critical scenarios and guides emergency responders to students in need. Provides customized response instructions based on established school safety plans. Ensures rapid accountability of students. Instantly alerts parents upon student updates for the purpose of reunification of student and parent. Allows for real-time communication between all users. Ensures faculty and staff correctly adheres to emergency procedures. Management of school safety plans with ability to share those plans with emergency responders. Does your school struggle with taking student attendance consistently? Would you be able to accurately account for every student during the school day? Trinity-Attendance assists schools to manage, monitor, and communicate attendance for their students quickly and easily. Campus and classroom check in and check out. Off-campus events and transportation check in and check out. Parent and administrator alert to activity and anomalies. Report current and future absences. Accounting of excused vs. unexcused absences. Eliminate the time consuming process of teachers and administrators taking and recording attendance and the need to call parents to follow-up on absent students. Management of daily schedules, classes, teachers, and room numbers. Management of excused vs. unexcused absences and related reasons. Increased consistency of attendance taking among faculty. Automated notifications to teachers and administrators to ensure attendance is being entered correctly. Assists with monitoring attendance levels and ensures that acceptable levels of attendance are established and maintained. Integrates with existing attendance systems. The management of discipline is an essential element in educational practice. 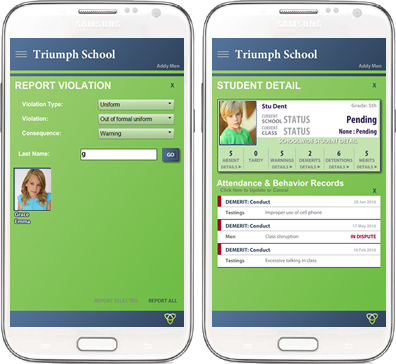 Trinity-Discipline helps teachers manage behavior in their classrooms quickly and easily. The application captures and generates data on behavior that teachers can share with parents and school administrators immediately. Report infractions and determine consequences. Issue merits and award points. Immediate notification to parents upon all activity. Provides parents and students with an opportunity to dispute infractions. Real time communication with parents regarding discipline issues at school. Consistency with teachers enforcing discipline policies. Accountability for teachers correctly enforcing discipline policies. Immediate consequences which result in immediate accountability. Reduces overall administrative tasks such as reports and data entry. Customizable to meet specific discipline management requirements. If you see something... say something. 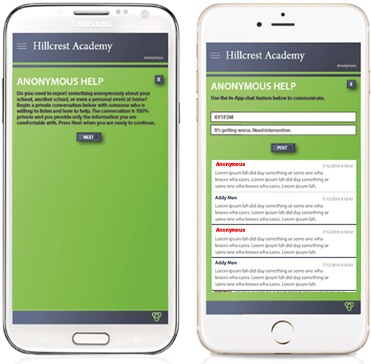 Trinity's Anonymous Reporting is a simple and powerful solution to anonymously report bullying, personal issues, or any other safety concern. Many anonymous reporting tools are available, but not all are integrated within a robust school management platform. Gives students the ability to communicate anonymously with a school representative about any troubling issues, threats, or safety concern. Allows an avenue of private communication to be established that might not have been possible without anonymous reporting capabilities. Capable of identifying the reporter in serious or life threatening situations as well as in cases of false reporting. Contributes to a safer school by providing a means for students to be heard and school administrators to take immediate action. We can't just worry about students only when they are on campus. Tracking students during school bus transport to and from school is vital. Trinity goes beyond video surveillance and "back of the bus" alarms, and in conjunction with improved school attendance tracking, never again will students be accidentally left on and trapped inside a school bus. 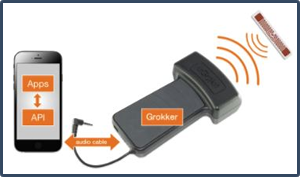 Easily installed on school buses to track students from time of pick-up to time of drop-off. Readers report exactly who is riding at all times. Text alerts sent to parents and school administrators within minutes of a student not being where they are supposed to be. Alerts based on pre-determined pick-up and drop off schedules for each and every student. Eliminates potential fatalities due to students being left on and trapped in buses during the school day. Communication is always key. Trinity includes both a crisis and non-crisis message center. When not in crisis, faculty can message the enitre student body, parents, other faculty, specific user groups, specific grades, specific classes, and individual users... whether it be a reminder for school pictures or a follow-up on a math assignment. 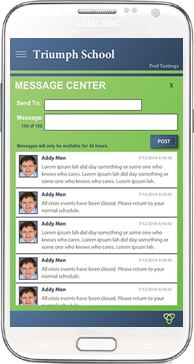 During a crisis, crisis-only messages and events are displayed to all users for the benefit of tracking individuals and alerting to crisis activity. Features a Community Message Board in both Crisis and Non-Crisis Modes. Enables administrators and faculty to send messages to the entire school or targeted individuals or user groups. Trinity can be used as an active or passive system. Trinity, as an active system, requires user input to track student attendance through events such as front-desk check-in, teacher classroom check-in, and parent check-out. Trinity, as a passive system, utilizes RFID readers installed at school entrances, main thoroughfares, and inside classrooms to report attendance automatically without user input. Trinity can be used as an Active System where faculty manually check-in students, or as a Passive System where RFID Readers installed in classrooms and throughout the school automatically track each student’s movement. Readers can be installed at entrances or handheld in case of crisis. Readers have a general use range of 6-10’ and can read up to 25’ in optimal conditions. 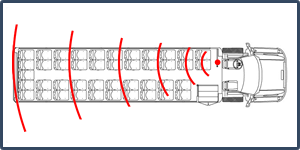 Readers attach to mobile devices through the audio port to connect to the Internet and communicate with the Trinity system. ID tags can be attached to ID badges or sewn into school uniforms.